Agile sprinting leaps and bounds! Many organizations have been quite successful in achieving agility whereas many are still struggling. The success is normally not achieved via textbook implementations of Agile methodologies; as many trials are still struggling to realize the true agile benefits. In this series of posts, I am going to discuss the four facets of the Agile, that plays a very pivotal role in Agile and benefits realization. These facets are more or less very common to all methodologies under Agile umbrella. The Manifesto for Agile Software Development describes the five values and twelve principles; which don’t need any introduction. These are described in simple language; which is precise, meaningful but hard to achieve in true spirit and maintain consistency over the long period. Often practices and processes deviating with negative influences to the values and principles lead to failures. Sometimes it might be hard to notice such anti-patterns in short-term but they have very negative impacts to agility. 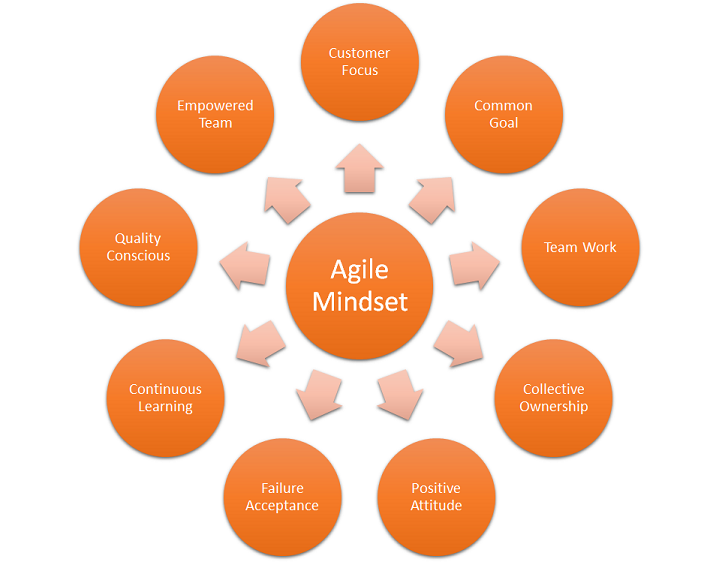 Agile mindset is not something that need sea-change to individuals and group’s characteristics; but these require acceptance, adjustment and adaptation to specific assumptions, methods, choices, working style and tools. Even though it might sound simple but due to the very intrinsic nature of people’s behavior, attitude and believe it’s very hard to practice and sustain. Customer Focus – One of the critical success factor for Agile team is the customer-centric approach in order to accept changes and feedbacks, participative decision making, and adaptive planning. The success of Agile project is measured in terms of business value delivery which determines the customer delight. Common Goal – Agile team should be aligned to common short-term and long-term goals; which should be derived from product vision. Every release and iterations should have specific goals defined and the team should agree and confirm to achieve these goals. Collective Ownership – Agile team should collectively own whatever they do to achieve the common goal. They individually should be responsible for their own work as well as a collective outcome of the group. The blame game, finger-pointing, unhealthy competition, partiality among team members are some negative traits that degrade the overall performance and agility of team. Team Work – Agile advocates team-work for team success instead of heroic behavior or individual’s success. The philosophy of sink-and-swim together applies for Agile team who should work together to achieve the common goals. Every team member should be willing to go out of comfort zone to take a risk, help and train others. Positive Attitude – Agile team members should have positive approach and attitude towards the work. Everyday challenges, problems, and short-term failures should not deter their normal routine; rather there should be a continuous endeavor to deal with them with greater deterrence and positive attitude in a timely manner. The core problem needs to be dealt with to convert every problem into opportunities. Failure Acceptance – Team members should be willing to accept failure in order to learn and innovate. If one method of solution approach does not work then another method should be applied after introspecting and accepting the lessons learned. It’s not always true that ‘you need to fail first in order to learn something’; but the concept of ‘failure and learning’ truly applies to Agile way of working, because it helps to identify the potential risks, bottlenecks, issues so that the appropriate solutions can be found while learning valuable lessons during the course-correction until success achieved. Continuous Learning – Agilists continuously quest for self-leaning and self-development. They always have the thirst to develop technical and functional knowledge and skills through numerous opportunities such as inspection, adaption, feedbacks, brainstorming, group discussion, meet-ups, and self-learning etc. Quality Consciousness – The end-result quality of outcome achieved is an important aspect of every process and method. But Agile need conscious efforts from the whole team to continuously improve on software quality to continuous design, refactoring, and testing. For Agile team, testing activities are collective ownership and teamwork, where every team members are responsible to testing for quality assurance. Empowered Team – Agile principle talks about the self-organizing, cross-functional team. This is just not enough unless teams are trusted, motivated and empowered to localized decision making. Management should ensure that they renounce the command-and-control approach of project management. Every team members should feel empowered to make the decision in their area of interest, feel important to be part of the team, trusted by their managers and enjoy ownership to task through self-allocation. The whole point of Agile mindset should be to continuously improve on practices, processes and tools being used in software development, testing, and delivery. There should be the continuous effort to learn and find opportunities with every failures and problem in order to achieve agility. 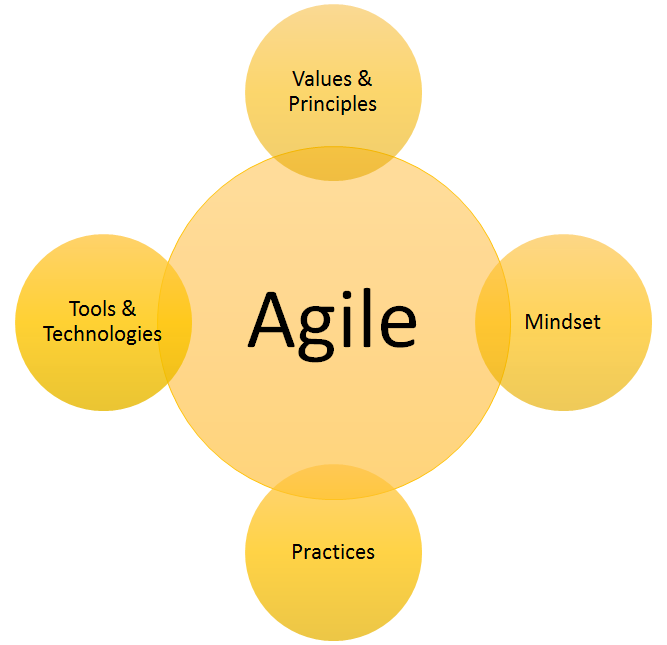 In the next post, I am going to cover the Agile Practices, Tools and Technologies. Stay tuned.